Green Innovators Competition judges Ewan McEoin and Renzo Scacco; finalists Arthur Georgalas, Ruby Chan, Peter Hermez and Finbar McCarthy; judge Dr Cathy Oak; and host Deputy Lord Mayor Arron Wood. 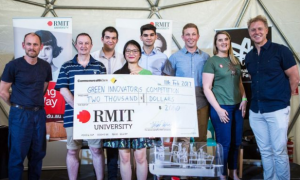 RMIT Master of Design Innovation and Technology graduate Ruby Chan has won a prestigious innovation prize at the National Sustainable Living Festival for her ‘Moducware’ range of eco-friendly compostable food containers. The containers are made from naturally sourced and sustainably manufactured materials, such as plant-based polymers and repurposed agricultural fibres, which can be fully composted after use and leave no lasting effects on the environment. The idea has won Chan the RMIT Green Innovators Competition at the 2017 National Sustainable Living Festival, which supports designers, engineers, environmentalists, planners and others to develop their best “green” ideas into viable products. Chan said she plans to use the prize money ($2000) to patent the material and market it as a replacement for harmful takeaway food containers which are rarely recycled and often end up in landfill. “The emphasis was on sustainable manufacturing practices, food-contact safety and versatility,” she noted. All of the finalists have also earned the right to join the RMIT Activator, a start-up incubator where participants are given access to coaching, resources and facilities to develop new ventures.